Price: $3.99 (as of 05/31/2015 at 4:30 PM ET). 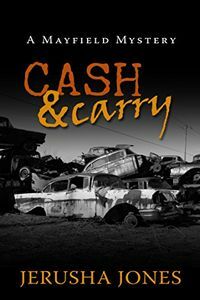 Nora Ingram-Sheldon's family history is coming back to haunt her — in the form of threatening mob enforcers and extortion, putting all she holds dear in peril. Turns out her connections with organized crime aren't just complements of her marriage to Skip Sheldon. Her father may also have a dark past. But since Alzheimer's prevents him from helping his only daughter, Nora has to scan her own memories. Does she know the mobster who has her in his sights? How will she compete with a ruthless man whose heavy-handed tactics have garnered power over the farthest stretches of society — from the lowest, back-alley gambling joints to the upper crust of politicians and wealthy philanthropists? And can she protect the growing number of castaway boys sheltered on her remote Mayfield poor farm property? See all four mysteries in the highly reviewed Mayfield Cozy Series for $3.99 each on Kindle. Find more newly released mystery, suspense and thriller titles on the Omnimystery News Facebook page.